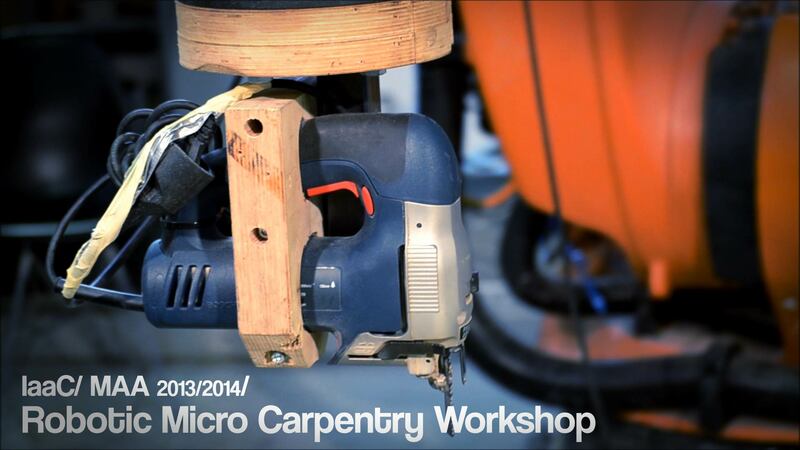 For the development of the microcarpentery workshop, a class of 22 people was distributed in subgroups to fulfill the dream of building a minimal chair, using the powerful KUKA robotic arm and standard carpenter tools (sander, drilling, jigsaw, and planar). Each one of the different groups was assigned the task of taking care of one machine and one part of the chair. During five days we were learning how to set the KUKA features, playing with the console, and following carefully all the instructions given by Tom Pawlofsky, to figure out how to set all the coordinates the makes the KUKA follow the right traks to cut, drill, and sand the wood. The initial step was to set the tools, on a external support and make the robot recognize the position of its coordinate origins. After several hours setting up the tools, we had to produce an external device that would be attached to the arm, to hold the wooden piece (after being cut) to be sanded and drilled for notching with the other chair components. The Practise Fabrication // Robotic Micro Carpentry Seminar, led by Tom Pawlofsky – ETH – with Alexandre Dubor and Sofoklis Giannakopoulos, explores the KUKA robot as a multi-tool, micro factory. The aim is to give an introduction to robotic fabrication, focusing on setting up processes and tools to be used with the robot. The students are learning and practicing how to teach and offline program the robot’s movements and tool-paths. In fact the first couple of days of the workshop have been dedicated to the student’s understanding and manipulation (manually moving the robot) of the Kuka Robot. The ambitious objective of the Seminar is to mass-produce wooden chairs, where the robot will handle all steps, from shaping the elements to applying the connections, with the aim of integrating digital planing and production into traditional craft.